The selection meeting for the summer issue of Cast On was Tuesday in Zanesville. 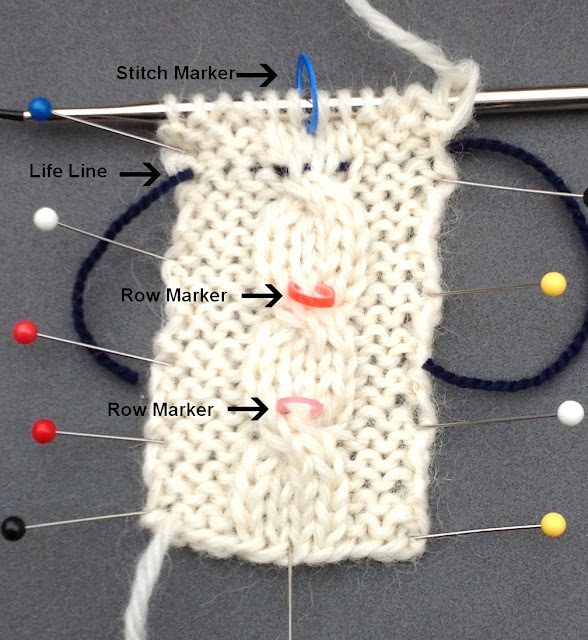 The Fashion Framework article will be on shrugs and the Stitch Anatomy lesson will be on the trinity stitch. There were lots of lovely proposals. I am going to do a linen dress, a sleeveless blouse with a peplum and socks with the trinity stitch. I hope none of the yarn arrives until after Christmas. I still have gifts to knit. A few new orders and lessons arrived this week. It continues to be slow and I expect it will remain so until after the holidays. Handmade gifts are so wonderful. What do I use these for? Anytime I want to mark a place in my knitting I use them. The photograph shows how I use them in cable patterns. Most knitters have difficulty "reading" cables. By that I mean counting the rows. What I do, is place a marker in one of the cable rows, generally row 1. Where do you get elastics? I get mine from a wholesaler. You have to buy 50 packets of 100 since I give them to my students. If you know an orthodontist or a kid who wears braces, you are set. 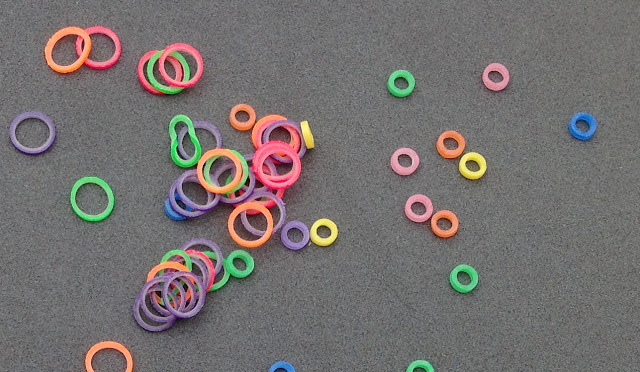 Elastics come in different sizes and weights. I use the 1/4" for most projects but the 1/8" are ideal for socks. They cannot be used as stitch markers as they do not slide. If you have a latex allergy you have to be careful to get latex free elastics. Another way you can mark your rows is with life lines. To place a life line, you thread up a needle with thread or dental floss and run it through the stitch ON the needle, taking care not to split the stitches. You then continue working. Life lines are essential for complicated lace patterns. If you make a mistake and have to rip out rows, the life line holds live stitches. It is very hard to rip out lace due to the yarn overs and decreases. If you leave the life lines in you can use them to count rows as well. KnitPick interchangeables have a hole in the needle. You can put thread through the hole on the right needle and this will place the life line as you work. This is a lot easier than trying to run a needle through the stitches on the needle. Salon will be on Sunday as I will be at Un Ballo in Maschera. It is the 200th birthday of Verdi so they are doing quite a few Verdi operas. I've seen Ballo before in Chicago and in Vienna. I am looking forward to this production. The running time is over 4 hours but that includes 2 intermissions. I better bring some knitting. I'm still working on gifts. The trip up to Zanesville cut into my knitting time. I finished up the mitts and the hat for Martha (good thing she doesn't even know I have a blog!). 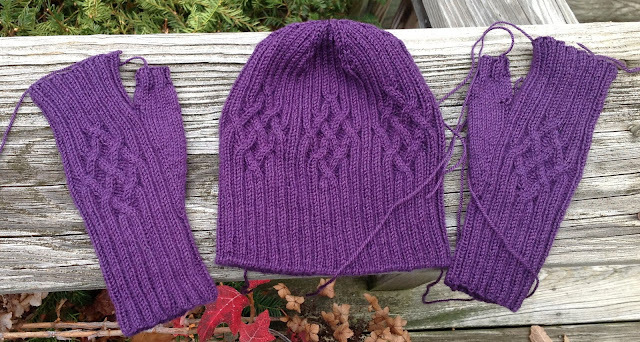 I could use the Happy Sparkle Day pattern for the mitts but not for the hat. I had it almost done and I decided it needed to be bigger so I started over. I also thought an invisible cast on would work better. Everyone is getting mitts this year. Some may get hats as well if I have time. 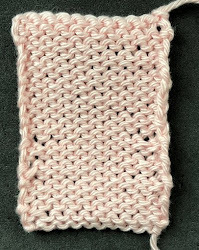 I am using stash yarn...Knit One Crochet Too Richesse et Soie which is 65% cashmere and 35% silk. I am sad they don't make this yarn anymore as it is wonderful to work with. I have several colors. 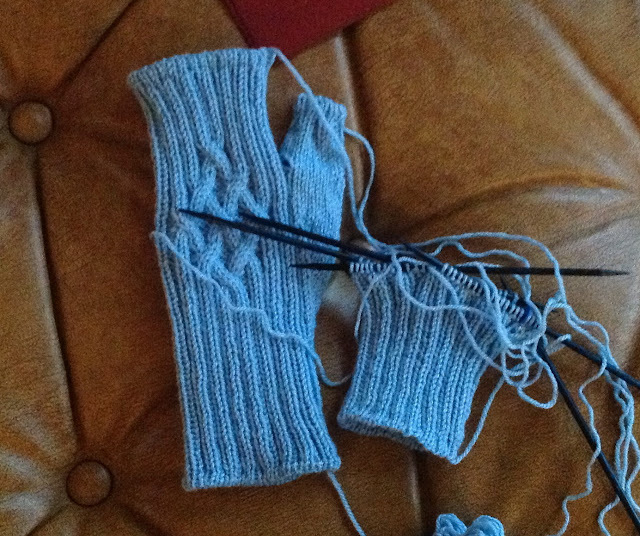 Here are the next pair of mitts. I used invisible cast on and bind offs just to make it a bit more interesting. I have to fit in my knitting with baking. I always bake 15 or so different types of cookies as gifts for friends and family I don't knit for. Yes, I am crazy! To think I used to do this AND stage manage the Nutcracker as well.